Good email senders understand the importance of a regular and accurate email campaign tracking and analysis. Using email analytics you can measure your email campaign performance over time, control its effectiveness and plan your future campaigns focusing on the recipients' interests. Email tracking is a fast and simple way to optimize the email design and layout, promotional offers, and links to the audience's preferences. G-Lock Analytics makes this easy as never before. G-Lock Analytics is the powerful email tracking service helping email marketers improve their email campaign targeting, conversion and revenue. You can track, evaluate and analyze email tracking results using comprehensive graphs and charts. 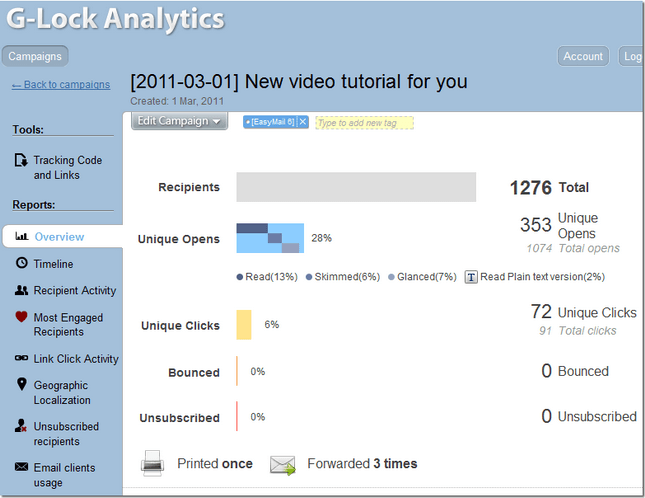 Realtime email analytics reports will show you how effective your emails are. It's simple and easy to use so that anyone can start benefiting from G-Lock Analytics in just a few minutes. You can use our email analytics service with any email marketing software. If you use EasyMail7 email sender software, the process is done almost automatically. It takes just a few mouse clicks to send an email with the tracking code inside. Learn more How to Use G-Lock Analytics with EasyMail7? To get started with G-Lock Email Analytics, you need to signup first. After you signup, follow the directions in your account to download the redirect script and put it to your website. If you put the redirect script to your site, tracking links that you will use in your emails will contain your domain and will look friendly for your recipients. What email clients your recipients use to open the email. Did they use a web account? Mobile device? Desktop email client? 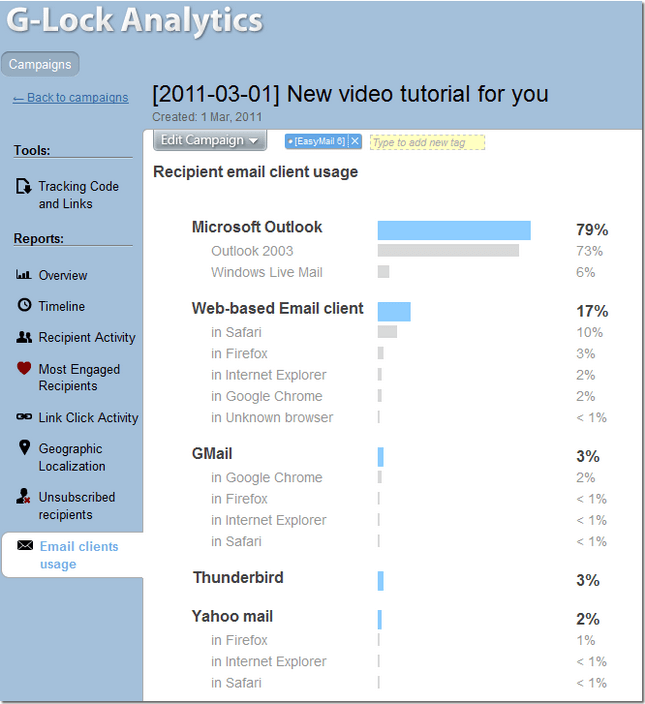 Check the "Email Client Usage" analytics report for accurate information. Who unsubscribed. If you don't have an unsubscribe management system, our G-Lock Email Analytics service provides you with the way to collect unsubscribe recipients. Simply copy-paste the unsubscribe link into the email. The recipients who unsubscribed will be collected into your "Unsubscribed Recipients" report. You can export them to a file with two mouse clicks. Why would you need email clients tracking? To focus your testing efforts and save your time. These stats allow you quickly optimize your email message for the most used email clients so that the majority of your subscribers get a good looking message. If you see that only a tiny part of your recipients open the email on a mobile device, you don't want to spend your time for tailoring your layout for mobile devices. G-Lock Email Analytics dramatically enhances the abilities of email marketers in retaining and converting customers, building relationship with their lists. You don't want to send your email marketing campaigns blindly. Using G-Lock Analytics you can easily discover how your recipients treat your messages, find simple ways to more effectively tailor your promotional messages to your subscribers' preferences, get maximum profit from your active recipients and increase your return on investment. Start using G-Lock Email Analytics today and take control over each message you send.